Microsoft is testing a new online partner directory called Pinpoint. Partners like its looks so far, but are waiting to see how it performs in the one area that counts: generating leads. Microsoft has long touted the mammoth size of its channel as a top competitive differentiator. No matter who you are or what you need, the company says, it's got a partner that can help you. But, of course, that giant channel can be as much burden as boon. The Microsoft Partner Program has, at last count, more than 400,000 members. How are customers supposed to pick exactly the right company from such an enormous crowd? For years, Microsoft has answered that question with a profusion of often-overlapping online partner directories. Its small business site offers one such tool, for example, while its midsize business site features another. Meanwhile, if you're looking for help with a Windows mobile solution, you have two search sites to choose from, one each for U.S. and worldwide partners. And that's not the worst of it, notes Mark Crall, president of Charlotte Tech Care Team, a managed services provider and Certified Partner in Charlotte, N.C. The real problem is that none of those tools produces much business for the partners listed on them. "We get very few leads," Crall says. That's a statement Microsoft hopes to hear less often, starting very soon. Since July, the company has been beta testing a new partner search tool called Pinpoint. When it officially goes live early next year, Pinpoint will give customers and partners a single, consolidated meeting place for the first time. Moreover, Microsoft believes Pinpoint's intuitive interface and amped-up search functionality will help customers seeking partners find partners seeking customers more easily than ever before. Will it work? Crall is one of many partners that see promise in the new tool. "Starting with a fresh slate made a lot of sense," he says. Ultimately, however, partners will judge Pinpoint by just one measure, Crall notes: how effectively it generates new opportunities. And that remains to be seen. "The only way they're going to make this successful is if they can drive business to the partners," Crall observes. "Otherwise, it's just another directory no one uses." Though Pinpoint will ultimately replace numerous partner directories, its chief predecessor is a service called Solution Finder. Officially, at least, Microsoft says there's nothing wrong with that tool: "Pinpoint builds on the momentum of Solution Finder to make a good thing even better," explains Larry Engel, the Microsoft general manager in charge of Pinpoint. But "good" isn't an adjective partners often apply to Solution Finder, says Reed Overfelt, chief operating officer of Reston, Va.-based Registered Member Mural Ventures Corp., a venture capital, software incubation and strategic advisory company. "Partners have historically been incredibly disappointed with it," he notes. Overfelt should know: Until September 2007, he was a general manager in Microsoft's field organization, responsible for sales to small and midsize businesses in the company's mid-Atlantic region. When any of the roughly 15,000 partners in that territory voiced criticism of Solution Finder, Overfelt was usually on the receiving end. Things haven't changed much since Overfelt left Microsoft; many partners remain dissatisfied or frustrated with Solution Finder. "It's very difficult to find, and then once you get there it can be a little confusing to use," complains Lee House, president of I.B.I.S. Inc., a business solutions integrator and Gold Certified Partner in Norcross, Ga. Worse yet, House adds, Solution Finder nets his company just one or two closed deals a year. "The numbers aren't where we would like them to be," he says. Same goes for Gold Certified Partner Mariner LLC, a developer of business intelligence and performance management solutions in Charlotte, N.C. In the last couple of months, it's received perhaps one prospect a week from Solution Finder. "We don't expect to get deluged, but certainly a handful each week would be super," says Sally Ann Phillips, Mariner's director of marketing and partner alliances. Meanwhile, in an era when companies such as Google Inc. and Microsoft itself are revolutionizing Internet search and social-networking tools like Facebook are exploding in popularity, Solution Finder has a distinctly Web 1.0 feel. Its search forms are clunky, its results lists are hard to read, and there's no way for customers to interact with Microsoft or each other. Pinpoint takes dead aim at such issues. Its warmer, less-cluttered interface makes finding partners "a more human experience," Engel says, while its simplified search, filter and browse features help businesses more quickly locate appropriate partners. That yields happier customers and greater quantities of high-quality leads, he says. As of mid-September, Pinpoint had already connected more than 4,000 customers with partners, according to Microsoft. Pinpoint's "ratings and reviews" feature lets customers grade partners on a five-point scale and submit positive or negative feedback about them. "This helps others in the Pinpoint community make better choices about who to work with," Engel explains. So far, many partners like what they see. "It's a really neat solution. We're very bullish on it," says House, who hopes Pinpoint will prove a better source of leads than Solution Finder. "I'd like to say we're going to get three to five new business opportunities [annually] on the low end, which in our business would be great," he says. Other partners praise the user-friendly design and partner-rating functionality: "That's a very effective method for sorting out the good [partners] from the bad," says Crall. Still, some partners have their beefs with the new directory. Crall, for example, wishes customers didn't have to log in to Windows Live ID before rating partners. That requirement helps guard against bogus input, he acknowledges, but also adds an onerous step to the review process-especially for customers who don't already have a Live ID. And partners have no way of defending themselves from harsh or misleading reviews, notes Betsy Bilhorn, director of Microsoft business development at Scribe Software Corp., a Gold Certified Partner and producer of migration and integration software headquartered in Bedford, N.H. "You can pull the post, but I don't think that's sufficient," Bilhorn says. Customers can see the review has been deleted, and, she says, that's bound to set their imaginations racing. Many partners say they're pleased that Microsoft is taking online directories more seriously because the Internet is playing an ever-larger role in their own lead-generation efforts these days. For instance, while I.B.I.S. continues to employ traditional tactics such as direct-mail campaigns and seminars to attract customers, search engines such as Google and Microsoft's Live Search now produce the lion's share of its new opportunities. "We're just getting a tremendous amount of activity from the Web," House says. "We're able to reach a lot more people a lot easier." What it is: An online marketplace intended to help business customers quickly find the right Microsoft products, services and partner companies. Spotlight articles about partners that are "making a difference to their customers"
How to join: For detailed instructions, click "I Need Help," then scroll to the "For Partners" section. And at a lower cost. Hiring a telesales company to place cold calls can cost up to $20,000 a month, House says. Buying pay-per-click ads on search sites costs maybe one-tenth that amount-and produces better results because nearly everyone who contacts the company by responding to those ads is actively seeking help. Meanwhile, so-called "organic" searches, in which prospects find businesses through ordinary search results instead of paid advertising, cost the company nothing. Though directories such as Pinpoint are typically less-fertile lead sources than search engines, many partners say that it's still essential to participate in them. "It gives us additional credibility," Phillips notes. "If somebody is looking for a particular solution or type of expertise and they see us on the Microsoft site, it's almost like an endorsement." Phillips, like many partners, views search engines and Pinpoint as complementary elements of a multi-pronged online marketing strategy. "If people go to a search engine and we come up, and then they go to [Pinpoint] and we come up again, they've seen us twice," she notes. "That really drives home that we're a partner you want to work with." The Pinpoint initiative falls within Microsoft's overall self-service efforts for partners, which have enjoyed significant growth this year. Partners looking to get maximum impact from Pinpoint should start by drafting a concise, articulate description of their companies, recommends Microsoft's Engel. "Not only does a well-written profile help customers more easily determine if a partner can help them, it helps partners be more visible in search results and in the browsing categories," he notes. In fact, a Microsoft usability study so clearly underscored the value of clear, succinct company descriptions that Microsoft now reviews profiles before they go live and works with partners to fix incomplete or poorly written content. Specificity is also important, advises Mike Harvath, president and CEO of Revenue Rocket Consulting Group LLC, a Bloomington, Minn.-based management advisory firm that works exclusively with IT services companies. He recommends that partners spell out exactly what skills they offer, how big their companies are and what kinds of clients they serve. "As people search and see themselves in your potential customer base, they'll reach out and do business with you," Harvath explains. Of course, most partners don't yet have a profile on which customers can comment. As of September, Pinpoint contained information on just 4,000 solutions from 2,500 partners. Engel says partners looking to add their listings should visit the Pinpoint site, click on the "I Need Help" link and read the detailed content guidelines. Pinpoint draws on existing information in Microsoft Partner Program databases, so users won't be starting from scratch in building their listings. However, they'll probably need to overhaul any existing content to meet the new tool's strict formatting and editorial-quality requirements. 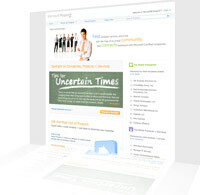 Pinpoint team members will inspect all updates and let partners know whether their revised content passes muster. Ultimately, though, it will be partner companies that render the verdict that matters, and it will be Pinpoint itself that they're judging. House, for one, is pulling for the new tool to succeed. I.B.I.S. gets plenty of business through its own sales and marketing efforts, so it doesn't rely on Microsoft for leads, House notes. "But if we do get that lift from Pinpoint that we're hoping for, that's just going to make us that much healthier a year from now," he says. "Hopefully, we'll get that lift."